Caramor - sailing around the world - Back to La Gomera ... just! Title: Back to La Gomera ... just! The last parcel we were expecting arrived Thursday morning and we decided to set sail on Saturday, towards La Gomera where we would anchor overnight at La Cantera. The following morning we would head for our final Canarian island - El Hierro where we would spend a few days before the crossing to Cape Verde. 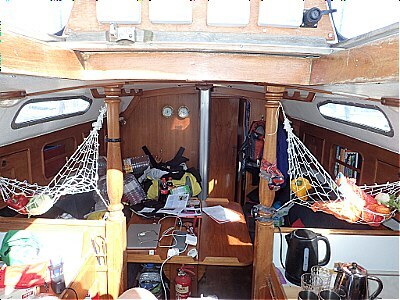 It may seem odd but we had a huge amount to do to get Caramor seaworthy, plumbing the new toilet and buying provisions for the ocean crossing meant the cabin was in a real mess. Franco spent a good part of Friday up the mast. Caramor was born well-conceived, John, her first owner had specified many excellent features into her design, he then continued to improve her during his ownership. However because something has worked for previous occupants doesn't mean it can't be improved. 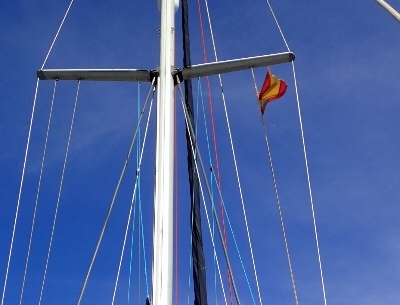 Franco had noticed that the lines that hold up the sail cover on other boats were often attached to the spreaders, whereas on Caramor they were attached to the mast. He pop-riveted new fixings onto the spreaders and the new position has improved the way the sail stacks and eliminated the irritating noise of the rope slapping the mast. While up there he also fitted a plastic strip along the edge of the spreaders to reduce the rub on the main sail when sailing down wind or on a broad reach and he fitted a new halogen bulb to our deck floodlight (the old one was corroded) - the design of the light is very poor, there is no lens so the bulb is fully exposed to the elements. Curiously, that design is no longer available. On Saturday we woke up early as there were still a few jobs to finish but by 10:30 am we were ready to leave. Our skipper had announced: "I've checked the weather and it is just as you would expect this time of year, steady north-easterly winds". I had returned the toilet keys to the office but had failed to retrieve our 20 Euros deposit. I got on rather well with the two ladies in the office but they were known in the marina as 'The Witches'. I would turn up most mornings with a big smile and a cheery "Hola, any parcels for me?" and over the weeks they had warmed to me. Witch no. 2's job seemed to involve staring at a computer screen all day while sighing loudly and issuing tokens for the washing machine (which didn't rinse) and taking the 4 Euros payment (all without looking up from the screen). Unfortunately for her, Witch no. 1 was on leave so she had to deal with the humans. As I had handed her the keys she had said: "copy of the receipt" (she still didn't look up). "Oh no" I thought, "just the kind of small piece of paper Franco would bin". We motored round to the fuel quay and I went back to the office "I've searched everywhere, I can't find it". With a very pained look (Witch no. 2 is used to taking money), she gave me back our deposit. I said goodbye and she gave me a huge grin before plunging back behind her computer. We set sail in perfect sunshine and light breezes, in no time at all we were cruising past the light house on the southernmost tip, as we got round to Los Cristianos the wind died completely. Over the next hour it came from every point of the compass! Eventually it picked up again, from the north-west, bang on the nose for our course to La Gomera. Change of plan: "We weren't that keen on La Gomera after all, we'll sail overnight and go straight to El Hierro". By 4 pm we were parallel with La Gomera but a fair way south of the island when the wind died once again. We didn't fancy four hours motoring to get to the anchorage at La Gomera, but then we didn't fancy a night becalmed either. We changed course towards La Gomera, after about two hours motoring we hit the acceleration zone and within very little time the wind was gusting 30 knots and we had reefed the sails. It was dark by the time we reached the anchorage by the derelict tuna canning factory. I steered us into the middle of the bay, with the assistance of our electronic charts and our trusty echo-sounder and Franco dropped the pick. It was a calm night with very little swell and we spent a very pleasant night. Dinner was goat and butter bean (thank you Jenny) stew.